Automatically Detects The Wire Binding Size, Adjusts For The Correct Pressure And Closes With A Simple Push Of A Button. 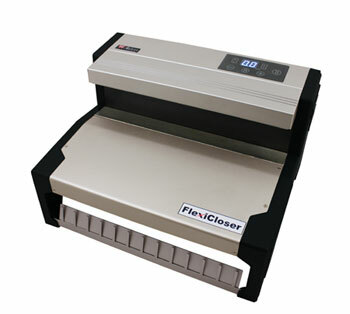 The FlexiCloser is the first automatic wire closer with the Smart Detect System. This system allows the FlexiCloser to automatically detect and close 3:1 or 2:1 wire bindings with the simple push of a button. The unit has a LCD control panel that is easy to read and operate. The micro-adjust keypad guarantees a perfect closure with 3:1 and 2:1 wire bindings. The unit comes with a built-in safety sensor in the closing section that provides safe and trouble-free closing without the risk of injury. The built-in wire holder allows for easy insertion of the punched paper into the wire bindings. The unit features a horizontal magnetic back wall that aligns and holds the wire bindings securely in place during the closing process. The FlexiCloser closes wire bindings from 3/16'' to 1 12'' in thickness and up to 11'' in length. This electric wire closer is a time saver and provides an excellent way to increase productivity.